The Times reports that German Chancellor Angela Merkel is furious about the alleged leak from a dinner in Brussels, which claimed Theresa May begged for help with Brexit. 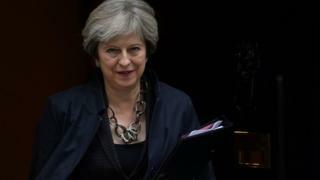 Mrs Merkel is said to be concerned that further hostility from Brussels could lead the talks to collapse, which could in turn bring about the fall of Mrs May's government. The Daily Telegraph believes the leak amounted to a character assassination. The Sun comments that every time Theresa May extends the hand of friendship to Brussels, they pull her close, only to stab her in the back. The Daily Mirror says that whatever the truth over who said what, the prime minister isn't an inspiring leader in the most important negotiations to engulf the country for nearly half a century. In other news, the Times claims that Catalan separatists are threatening mass civil disobedience if Madrid carries out its threat to depose their leaders. The paper says civil servants, fire-fighters, teachers and students are preparing to resist direct rule. It also highlights a warning from a senior Spanish cabinet minister, who says Catalan police would be used to quell protests. The Guardian warns that the Catalan crisis is getting more volatile and dangerous. The paper calls for an honest broker to help the two sides back from the brink. Buzzfeed News, meanwhile, says women are coming forward in increasing numbers to report sexual assaults on the London Underground. It says data obtained under the Freedom of Information Act shows that transport police recorded more than 1,700 reported assaults in the past two-and-a-half years. That's more than in the previous four years put together. Police still estimate that 90% of incidents go unreported. The Financial Times reports that some retired workers have used new "pension freedoms" to fund alcohol and gambling binges, and are then falling back on benefits. Rather than manage their pension pots wisely, the paper says some have frittered away substantial amounts. A written submission to a Commons committee revealed that one man released £120,000 from his pension pot and spent every penny on drink, betting and a car. The Daily Express uses its front page to launch a campaign for cuts in foreign aid, saying the money should go to help the health service and old people in the UK. The paper says Whitehall sources believe International Development Secretary Priti Patel has worked hard to eliminate some of the more spurious schemes funded by taxpayers, but says critics believe the government should go further. Finally, scientists have found proof that humans are hardwired from birth to find spiders scary, according to the Times. The researchers found that six-month-old babies who were shown pictures of spiders showed signs of stress by dilating their pupils. In contrast, other studies have suggested that fear of animals like rhinos and bears has to be learned, and babies don't associate images of them with fear.